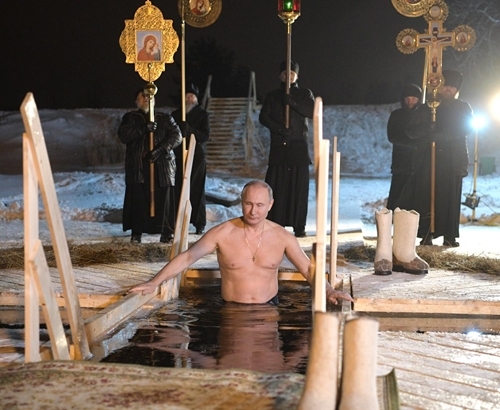 Following a Russian Orthodox Christian tradition, President Vladimir Putin took a dip in freezing water at a monastery on the Feast of the Epiphany on Thursday night. The Epiphany Bath, as it is known, is celebrated on January 19, the day when the infant Jesus is believed to have been visited by the Three Wise Men, thus revealing Himself to humankind. The practice is said to relate to the symbolic baptism of Jesus in the River Jordan. Putin wound up a working visit to St. Petersburg and the Leningrad Region with a visit to the Russian Orthodox male monastery of Nilo-Stolobenskaya Desert on Seliger Lake, the state-run TASS news agency cited Kremlin spokesman Dmitry Peskov as saying. Although the popular annual ritual was not observed in central Russia this year due to frigid weather, Putin took the plunge because "the temperature around the lake was no lower than 6-7 degrees below zero that night,” said Peskov. This year, Metropolitan Iosif of Kurgan and Belozersky cautioned the faithful not to perform the ritual, as it had only become popular due to media coverage and was not sanctioned by the Church. On his church website, he cited a book authored by Archpriest Sergei Bulgakov in Kharkiv in 1900, which says that the custom originated in superstitious practices and "means demanding a miracle from God, or else completely ignoring your life and health." TASS noted that the Russian Orthodox Church "looks favorably" on the tradition, however, only "if a person treats the plunge into the ice hole with reverence, and his health allows it."